Is an all natural dog treat healthier than other dog treats? This is a question we often are asked. So first, let's talk about what it means. 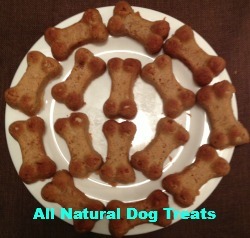 The treats in the image above are made from an all natural dog biscuit mix from K9Cakery.com. It is supposed to mean that the ingredients are all from natural substances, as opposed to "unnatural", or synthetic. The phrase itself denotes no nutritional meaning and there are no FDA regulations about it. Manufacturers use it to suggest that their product's ingredients are found in nature. High fructose corn syrup is made from ingredients that come from a plant. However, it is not necessarily healthy to eat it in large quantities! The food manufacturers that use the label correctly want you to know that their ingredients have not been altered from their natural state as found in nature. And that their product is not full of preservatives and chemicals. The best thing to do is to check the ingredients. The ingredients listed first will be the ones that are predominant. If there is a preservative or a sugar listed toward the end, it means the amount of those ingredients are miniscule and they are present to either make the product work correctly or keep it from spoiling or to hold together. You just don't want to buy something that lists one word after another that you can't pronounce! If you choose to buy natural dog treats, just check the ingredients to make sure they really are. This is not the same as sugar free or fat free. 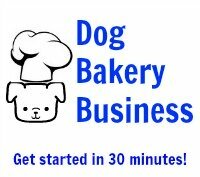 If you prefer to make a dog homemade treat that you know will be all natural, you can buy biscuit mixes from a dog bakery supply that are all natural. Make your own healthy homemade dog treats and you will know exactly what the ingredients are! This mix offers both a cake mix and a biscuit mix all in one. There are directions on amounts of different flavorings to add to the mix so you can make various dog treats using the same recipe. 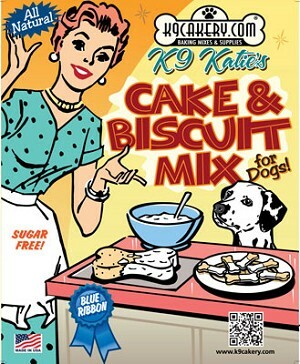 Click here for more dog bakery supplies to meet your baking needs for pets.